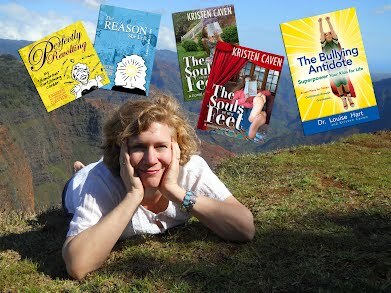 Kristen Caven never wanted to be a writer. She wanted to be an artist with long blond hair, twelve pets, and a pantsuit with a zipper down the front. She wanted to be creative, to make people feel delight, like her childhood heroes Walt Disney and Jim Henson. She wanted to be someone interesting that people wrote about. Besides, wasn’t it Wallace Stegner who said, “If you don’t have to be a writer, don’t.” Because (and I’m paraphrasing here,) it’s a hard thing to do, and more often than not unrewarding (except intrinsically—and that only when one’s talents and skills align and there is time to engage with the muse without starving to death), and besides that, one can starve to death or choke on clichés. But the girl can’t help it. (Did you see that last daring, gymnastic sentence? The one she, deftly writing about herself in third person, just wrote? Did it not take your breath away? Did you shake your head at the sheer craftsmanship of it? The complex detours? The deft use of parentheses?) Born on Personology’s Day of the Velvet Voice, Kristen’s got a lot to think about and, well, a lot to say. She is the daughter of a writer, the mother of a writer, and married to a writer. Writing is a central part of her intense and sometimes dazzling life. An indiscriminate and voracious reader able to discern the intentions behind every type of writing, she works hard to reach her readers with every type of writing. Somewhere in her mid-thirties, Kristen realized how profoundly books had influenced her life. She was an early reader and fondly remembers the privileges that skill gave her as a kindergartener (going to the school library alone for ‘big books’), and one of the earliest ambitions she recalls was to read every book in the library. As a latchkey kid, she spent her after-school hours lost in their company until dad came home and she jumped up to pretend she had been doing chores; she chose a Great Books college and left it because a book she read called her away; she worked as an editor, a publicist, and even a receptionist at a book warehouse. Although she had written indiscriminately for many years, she decided, at her first Saturn Return, that she should start taking herself seriously and start giving something literary back to the world. 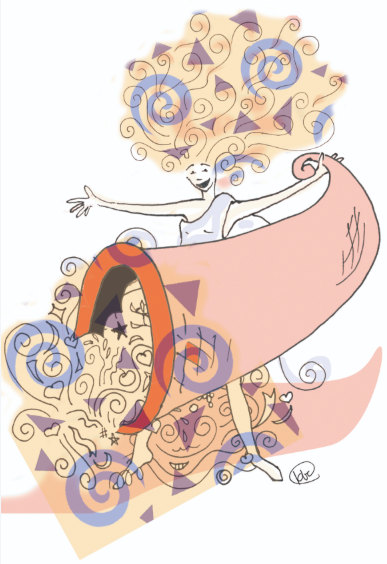 In addition to her dozen or so blogs, Kristen (Baumgardner) Caven has co-authored three books on parenting, published two memoirs about cartooning, and wrote the libretto for one triple musical about living a fairytale life. Kristen’s short stories, articles, essays, cartoons, and comics have been published in Oakland Unseen, Oakland Tribune, The Monthly, Rudolf’s Diner, Doorknobs and Body Paint, Synchronized Chaos, Full of Crow, The Sophisticate, and The Good Men Project to name a few. She has been blogging for ADDitude Magazine since 2013. She has been featured in The Monthly and The Montclarion, and presented at Octopus Literary Salon. Her book launches have been legendary. Her work is included in the anthologies 11/9: The Fall of American Democracy , and We Are In This Together. Awards include: Ardella Mills Essay Prize (The Warhol Effect), Bay Guardian Cartoon Contest winner—collection category (Inside the Mills Revolution); Quarterfinalist in the Writer’s Network screenplay & fiction competition (Shoes, a Mirror, and a Big Pink Rose), and the first annual Aluminous Flash Mob Play Festival (Be Mused).